Ancient roads. Historic buildings. Curious cultures. You’re invited to join Peter Eastway on a photographic investigation along the less traveled paths of Georgia and Armenia. “After my first journey to Georgia and Armenia with my friend and guide Mehmet Ozbalci, I’m really keen to go back. There is a new mountain valley we’ll visit and fingers crossed, we’ll get some great autumn colours or perhaps some early snow. 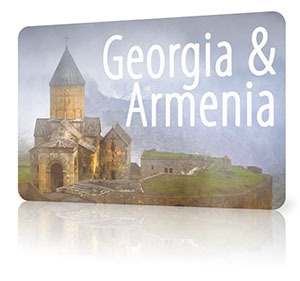 “But that’s just for the landscape and while I love this aspect of photography, Georgia and Armenia are equally about history, culture, architecture and its people. This is a true travel destination with opportunities to investigate many genres of photography. “Mehmet is a photography tour guide, based in Istanbul. He is a gentleman. He has over 25 years’ guiding experience in these areas. His English is first class. And importantly, he is a keen photographer and knows where to take us! “We get on really well together and I know this will be yet another great trip. Are you interested? “We will fly to Tbilisi, the capital of Georgia, from where we will do a circuit dropping down into Armenia and back. Deposit on booking US$500, balance payable by 1 August 2020. Minimum of 8 and maximum of 12 participants. • Accommodation in double/twin rooms in the kind of hotels as described in the itinerary. • All breakfasts, lunches and dinners as per itinerary. • Water, tea or regular coffee, soft drinks (like Coke, Fanta, mineral water, fruit juice in the can) at lunches and dinners. • All admission fees to the museums and places to visit in the itinerary. • English speaking photo guide and local guides. • Comfortable A/C van, driver, gas, parking etc..
• Bottled water in the vehicle. • Private arrangement for models in the Caucasus Mountains. • Arrival and departure airport transfers only on the official start and departure days of the tour (18 October and 1 November 2020).